A company that provides solar-powered energy to low income families. An app that helps managers track their employees’ moods. A startup that creates soil-free urban farms out of used shipping containers. The city of New Orleans is clearly no stranger to innovation. The best way for your company to show its own innovation at your next big event is with advanced tools, such as a 360 degree photo booth. The ultimate fusion of art and technology, 3D photo booths let you capture the full moment with an exceptional 360 degree view. A 360 photo booth tailored to your company’s branding at your next event will strike the perfect balance of fun yet professional energy. You finally can get Mardi-Gras-level crowds without all the ruckus that goes with it. Bullet time photo booths like these build a buzz around your products and services like nothing else, and they’re capturing memories that will extend beyond the event at the same time. At Pixperience, we’ve worked with Royal Caribbean, Dyson, Under Armor, HBO, Salesforce and more to expand the reach of typical experiential marketing campaigns. Using green screens, play-by-plays, event microsites and other up-to-date technological tools, we create experiences customized to meet your company’s business goals and target audience. From the French Quarter to the Garden District, we can easily meet you wherever you are, in both the conceptual and geographic sense. With a full view of your event’s best moments, bullet time photo booths tell the right story in a bold fashion. Talk to us to hear more about our services. 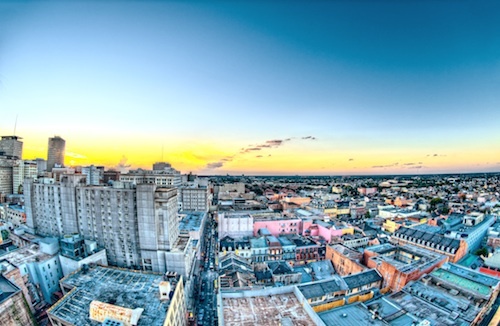 We’ll help make your company as distinct and awe-inspiring as the surrounding French and Spanish Creole architecture.